This was my very pick for today being a person that have many 2go crazy pals. This guide should help you easily link up your facebook account to 2go so you can easily chat with them on the go. 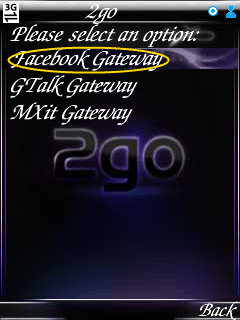 How To Connect Facebook Gateway To 2go With the facebook gateway menu provided by 2go, one can easily connect his/her facebook account to 2go, thereby enabling the user to chat with facebook friends while still in 2go mobile messenger. The following steps shows how you can connect your facebook account to 2go. >>Go to facebook.com and login with your info. >>Click on ‘profile’ in your facebook page. >>Then login to your 2go account. >>Then enter your facebook password. You should see something like ‘registration successful’. Enjoy! !